Sucker rod pumps are widely used in the oil industry. Sucker rod pump is a modified four-bar linkage, the whole structure just like a balance, one side is pumping load, and another side is the counterweight load for balancing. If the pumping load and the counterweight load have the same torque or their torque change consistently, then the oil driller can work continuously with a small external power. That means the balance performance is the key factor of energy saving. If the balance ration is 100%, the power from electric motor only used to lift 50% weight of liquid column and overcome the friction force, the lower of the balance ratio, the bigger power from the motor is required. The pumping load is changed all the time, but the counterweight cannot make the same change together with the pumping load. The sucker rod pump is driven by the motor directly in most of systems. The power of motors are always be enlarged too much to ensure safety operation, it increases the reactive power loss and reduces the operational efficiency of the motor. 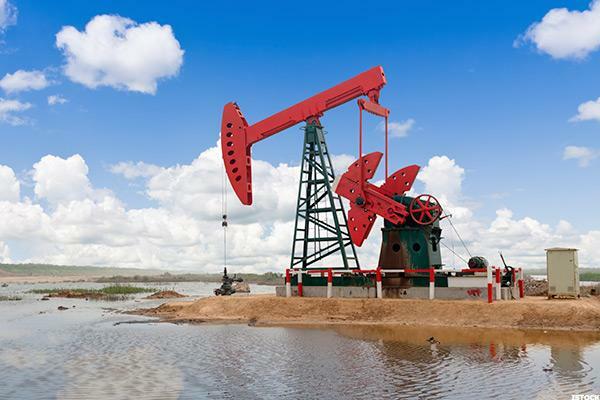 In another hand, the low productivity of some oil wells, dry tap working is existed; all the factors cause the operational efficiency of the complete system is too low. Some of the system’s operational efficiency is as low as 10%, and the balance ration of the driller is as low as 40%. According to the production characteristics oil field, to upgrade the system via the solution of “variable speed drive + energy feedback unit” will promote the energy saving performance effectively. (1)The system in the multi-step speed control mode: two steps of high speed and low speed, the travel switches are fixed at the up-running end point and the down-running end point, the step speeds are changed by trigger the switches. (2)The energy feedback unit is fixed to feed the regenerated energy back to the power grid. (3)The function of the variable speed drive output relay terminal is set as failure warning output. (1) Increase the power factor (increase from 0.25~0.5 to greater than 0.9), and reduce the apparent current greatly, lighten the burden of power grid and transformer, reduces the line losses, to save huge expenditure of system capacity enlargement. (2) To adjust the oil drilling speed dynamically based on the actual liquid feeding capacity of the oil well, increases the crude oil turnout and meanwhile reduces the energy consumption of low production oil well. (4) Soft starting of the system, prevents the mechanical shock of motor, gear box and oil driller, prolongs the working lifetime of the system, reduces the down time and increases the production efficiency.